Get 90% Off For Kids apparel and more. No coupon code required. Click link to activate. 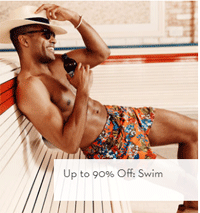 Get up to 90% Off for Mens' and Women's Swim. Up to 89% off for dresses. See website for more details. Get 60% Off for women's shoes Sigerson Morrison & More. Free Shipping for orders over $99 to all 50 states.